Piccadilly Carrot Souffle is one of the Piccadilly Cafeteria’s most popular recipes. I know when I have made this dish for people, they can’t believe it is carrots. Do you have finicky vegetable eaters? I would try the Piccadilly Carrot Souffle recipe on them, the sweet carrot souffle is quite delicious. Piccadilly carrot soufflé is very popular at Piccadilly Cafeteria. I know when I’ve made this dish for people, they can’t believe that they’re eating carrots. Do you have finicky vegetable eaters? I would try this recipe on them – maybe don’t tell them it’s made from carrots until they’ve finished eating their portion. 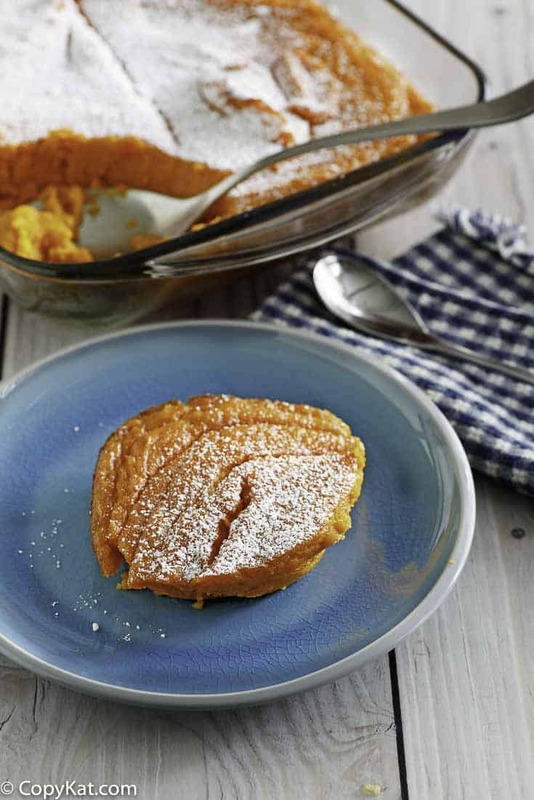 This carrot soufflé is sweet and quite delicious and doesn’t have an eggy taste. The first Piccadilly Cafeteria opened in 1932 in Baton Rouge, Louisiana. After twelve years of success serving up homestyle comfort food, a budding restaurateur by the name of T. H. Hamilton took over and grew the business. Today, there are forty-one restaurants all across the southeast. Favorite dishes are fried chicken, carrot soufflé, and a range of famous desserts. There’s always something for everyone at Piccadilly. When Did Soufflés First Puff Up? Soufflés have probably been around ever since flour, milk, eggs, and butter have been whipped up into different concoctions to please the discerning palate. The first recorded appearance of a soufflé dates from the early 1700s when a French cook, Vincent de la Chappelle, made soufflés for European dignitaries including Madame de Pompadour, mistress of Louis XV. To learn more about the history of soufflés. The soufflé has long been associated with French haute cuisine. If you have ever watched the movie Sabrina starring Audrey Hepburn, you might remember the scene at a Parisian culinary school where the master chef humiliates her (and most everyone else in the class) by his critiques of their failed efforts at making the perfect soufflé. “Too low; too high; too heavy; sloppy” he intones to each one. You can watch this short amusing scene about cooking souffles. But please don’t let it put you off making a soufflé. So, don’t spend time worrying how high your bubbly mixture is puffing up while it’s baking. The ingredients hidden inside will taste heavenly and light as a cloud – as long as you remember to turn on the oven. 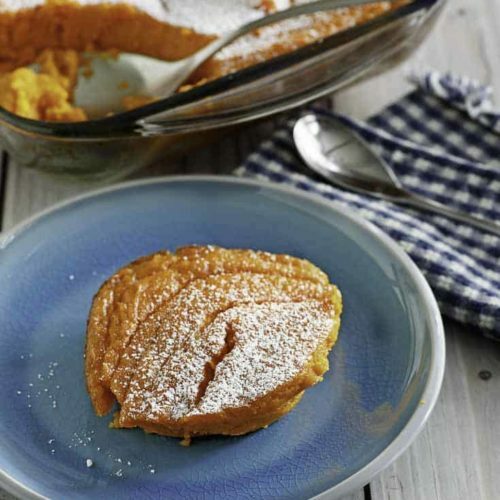 Want a Sweet Potato Soufflé? Click here. Make the famous Piccadilly Cafeteria carrot soufflé at home. You are going to love the great flavor. It’s the perfect side dish for the holidays, and your kitchen will smell amazing while it’s baking. Make the famous Piccadilly Cafeteria Carrot Souffle at home. Powdered sugar 1. Steam or boil carrots until extra soft. Drain well. 2. While carrots are warm, add sugar, baking powder, and vanilla. 3. Whip with mixer until smooth. 4. Add flour and mix well. 5. Whip eggs and add to flour mixture, blend well. 6. Add softened margarine to mixture and blend well. 7. Pour mixture into 13 by 9 inch baking dish about half full as the souffle will rise. 8. Bake in 350-degree oven about 1 hour or until top is a light golden brown. 9. Sprinkle lightly with powdered sugar over top before serving. I’ve made this several times by the recipe, at home, Christmas dinner, Thanksgiveing dinner, and church dinners, everyone has loved it every time. I grew a boatload of carrots and canned them last November. I grew another boatload of carrots this season, and figured I’d better start using up all the pints of carrots, LOL! Been having carrot souffle on my mind for two weeks now, and finally decided to look up a recipe. I found this one. Several modifications had to be made, out of necessity. First off, I canned my carrots with 1/2 Tbsp of canning salt because I didn’t have a sweet dish on my radar at the time. I tasted the salt when I opened them and decided to go for it. Especially with 2.5 cups of sugar, which, for me, is way too sweet. So, I cut it back to a little less than 2 cups of sugar. Cardamom is my new spice, girls! So, hey, why not? I ended up adding 1/2 tsp. to the recipe. Nice! Finally, I discovered I had only one stick of margarine, so, I added 1/4 c of vegetable oil. That’s it. And, if it tasted amazing BEFORE I baked it, you KNOW what magic happened in the oven!!! P.S. My oven must be slow, cuz, I just added 15 minutes to get it to set. It’ll keep baking when it comes out, too. No worries!! P.S.S. Thanks to the poster who said to use 6 cans of carrots. I used 5 pints of carrots and 1 pint of Butternut Squash that I also canned. My kitchen smells amazing right now!!! I made this recipe twice this week and oh my gosh!! It is absolutely delicious. I didn’t make any modifications to the recipe. I’m so happy I finally found a recipe that didn’t have that eggy taste!! 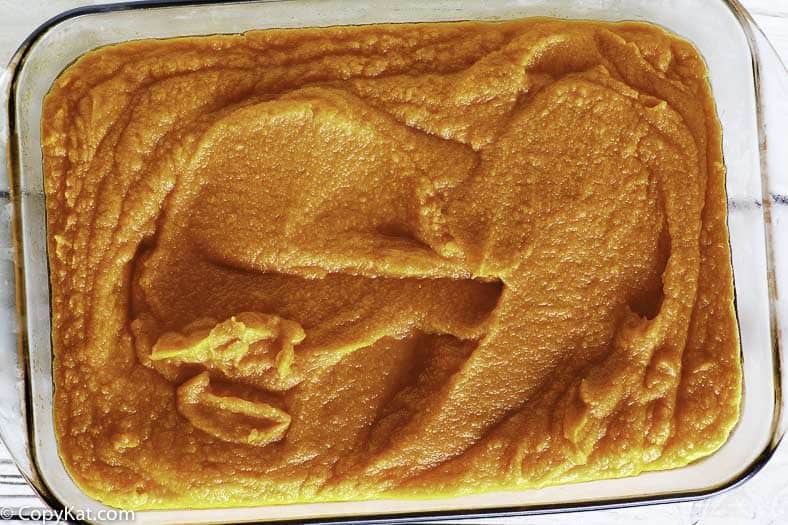 I make this every year but with 4 large sweet potatoes instead of carrots. I started substituting marshmallows for the powdered sugar. It changes up the recipe but is delicious both ways. Thanks for sharing. Can I use pecans in the dish? I microwaved the carrots by cutting them in pieces and put them in a bowl with water -cover with plastic wrap to steam. This way carrots don’t lose nutritional value and taste – like when you boil. To give an even better taste, I used half maple syrup instead of all sugar. Add cinnamon. I also beat the eggs for a long time to get stiff and folded the eggs in to make a souffle fluffier.